A non-surgical rhinoplasty or non-surgical nose job uses injection of safe and effective filler materials (typically Radiesse) to alter the SHAPE of the nose – ie, not the size. 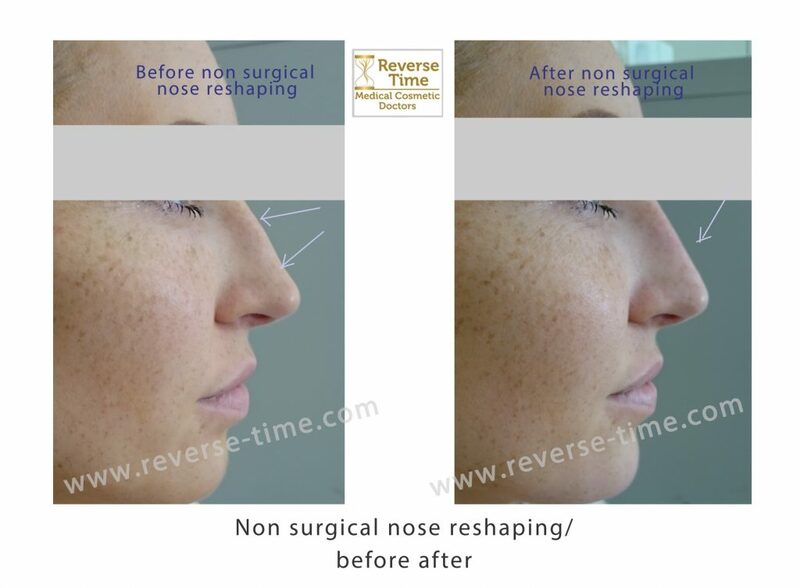 This is important to appreciate, as this procedure is not suited to reduce the size of the nose. 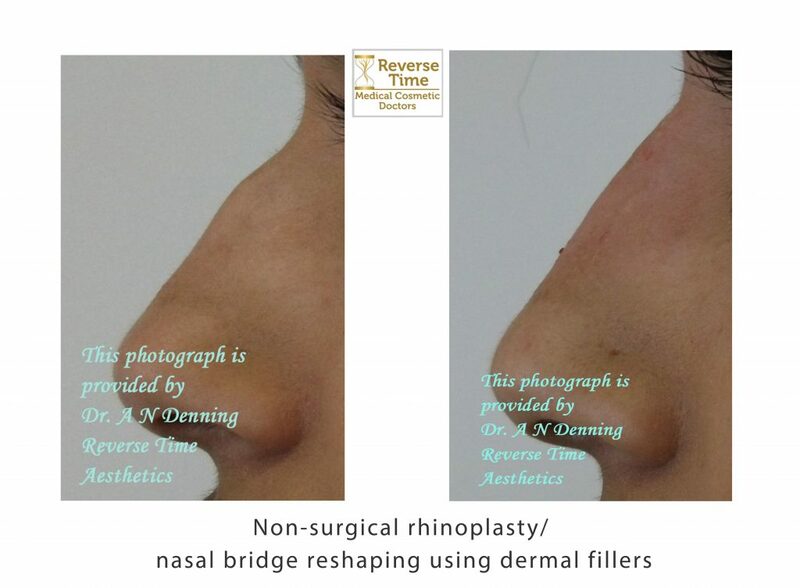 Non-surgical rhinoplasty is a quick and easy alternative for those who want to improve certain features of their nose but are not yet ready for a surgical rhinoplasty. Many patients also find that this can be a “preview” for them to obtain results without resorting to surgery and its inherent risks. Non-surgical rhinoplasty takes approximately an hour at the clinic, including the paperwork, informed consent, numbing time and treatment time. There is very little discomfort. Recovery is simple. The most common filler material used for non-surgical rhinoplasty is Radiesse. Radiesse is ideal for non-surgical rhinoplasty because it is soft enough that it can be injected and molded into shape, yet firm enough that it maintains its shape after injection. It also does not swell with water absorption like some hyaluronic acids. So it looks aesthetically pleasing on bony contours like the nose bridge and cheekbones. Radiesse is made up of tiny granules of Calcium hydroxylapatite (the main element of human bone) so it is very safe and well tolerated by the body. Often what prompts patients to seek a consultation for non-surgical rhinoplasty is that they notice “something amiss” in photographs, and identify for example a “bump” on the nose, a receding chin or less prominent cheekbone. This prompts them to consider options for bringing this feature in line with the rest of the face. If you are interested in a non-surgical rhinoplasty, this is probably the point when you approach a doctor for treatment. Before deciding whether the non-surgical rhinoplasty is ideal for you, you must appreciate that there is more than one reason for the nose appearing “not right for the face”. 1 – bone structure – the shape of the facial bones determines this, also any injuries to the nose itself. 3 – A flat midface or deficient cheek volume, drawing attention to the nose. The nose bridge can be subtly reshaped using a collagen stimulator like Radiesse. This will work best for case (1) and (2). For case (3), it is important to correct surrounding volume loss first, because adding any filler to the nose will in most cases make it slightly larger. A couple of sessions may be required initially. The results last over a year if nutrition and metabolism permit, and actually accumulate over time. Please note that features that look good on one person (one popular choice is Angelina Jolie :-)) will not always suit another person’s face, leading to distorted facial features in the near future. There is a specialised assessment I do to check this, don’t worry! What to expect at your consultation for non-surgical rhinoplasty? overall, is it suitable for treatment using non-surgical methods. The mid-face and the nose, especially the lower part of the nose has a unique pattern of blood supply – so if the filler injection is not done with excellent knowledge of the anatomy, serious damage can occur when blood supply gets cut off. In order to achieve sustainable results with patient safety as the primary goal, experienced and good cosmetic providers will carefully assess every patient, and set realistic goals. Even though these are “cosmetic” treatments, they carry significant risk. Most good aesthetic physicians will agree that a risk-averse and cautious approach with patients is better than an over-zealous one.